To say grand allegro was challenging for me would be an enormous understatement. I felt stuck in the ground. . . and I looked stuck. I did eventually work it out, though. Forcing myself to take men’s class played a role in that. While it was a wee bit on the humiliating side, it was also productive. You can’t help but push yourself to the absolute limits when all the astonishing male dancers are flying past you in the air. I felt so tiny, but somehow so empowered. I offer 3 tips I have picked up along the way that made no small impact on my large jumping skills. 1. Pretty Pliés Don’t Exist. They just don’t. When you need to jump high enough to beat the legs 6 times in the air, a polite plié won’t get you there. When you want your jeté to soar to new heights, you have to get down and dirty in the floor. Safe pliés, YES. Pretty pliés, NO. If you ask someone to jump as high as they can (without thinking about ballet) you will notice some interesting things about how they bend in their legs and hips. There is a sinking in the hips that takes place right before the push off and this sinking is exactly what we are told not to do from day one. Lift up. Don’t sink. Keep your hips under you, etc. But to get up in the air—I mean really up in the air—you have to sink. And then . . .
You sink, but then at the very bottom of that sink you immediately throw your whole self (hips, legs, torso, head, fingertips, everything) into the air. This must hold a ton of attack. It is incredibly aggressive and almost startling (at least it was always a little startling to me when I did it). If you don’t find the landing of the jump difficult to manage at first then you are not pushing hard enough. The magic really is in the immediacy and quickness of that push. You want to get to the top of your jump as quickly as possible and this requires fast action. I also will add that many dancers do push but they are pushing everywhere. It is just wasted energy and results in nothing but fatigue. What we want is to focus our energy on the muscle groups that are actually taking us into flight. Doing a large brisé? Don’t just push into the air. Push into the air with focused energy in that supporting leg. 3. Stay. And Then Stay Some More. Once you get up there, don’t come down! Live up there for a bit. This is where illusion really comes into play. We can make it appear we are defying gravity by simply holding onto our jumping position in the air longer than we think we can. So many students jump and then too quickly prepare to land. It is no good. Almost every dancer has more time in the air than they think. The floor is not as close as it seems. 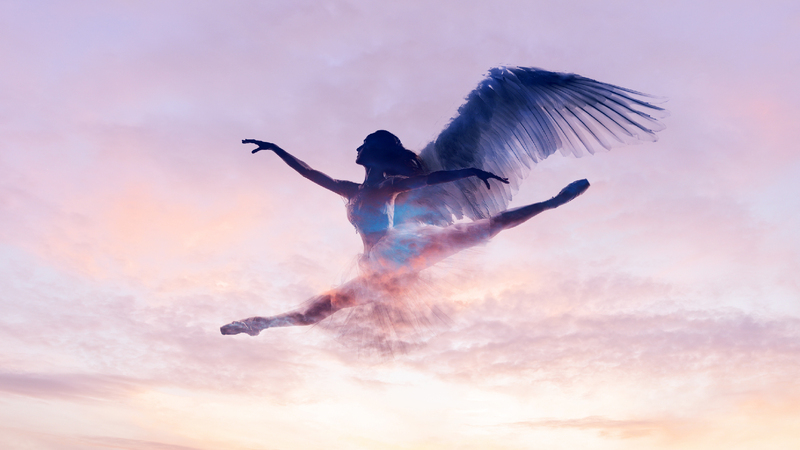 Challenge your dancers to hold beyond their comfort level, and they will find they have far more flight in them than they ever imagined. BONUS: This is not appropriate for all jumps, of course; but jumps that travel can find more height when the eyes and head are allowed to lower and are then tossed up on the push. Coordinating the push with the eyes, head, and arms will change the look of the jump for the better. Even if it doesn’t get the dancer higher in the air, they will appear higher and they most certainly will appear lighter. Feather light.